Meet Saule Chikeyeva and Catherine Haney – the latest winners of the 2014 GSS cIRcle Open Scholar Award! Saule Chikeyeva comes from the UBC Department of Educational Studies and won this Award for the work, “Policy Analysis of the Per Capita Funding of Public Schools in Kazakhstan” at: http://hdl.handle.net/2429/50452. Chikeyeva sets out “to better understand the per capita financing pilot project” in the context of the ‘chosen funding model and its educational aims through the lenses of efficiency, equity, equality, adequacy and accountability’. Catherine Haney (pictured above) is a PhD student from the UBC School of Nursing. Haney won this Award for her work, “Considering oral history: Methodological questions and reflections” at: http://hdl.handle.net/2429/46680. If her name sounds familiar, it could be due to the fact that she has published two other works in cIRcle – a 2011 MSc thesis at: http://hdl.handle.net/2429/39214 and a journal article at: http://hdl.handle.net/2429/45155. 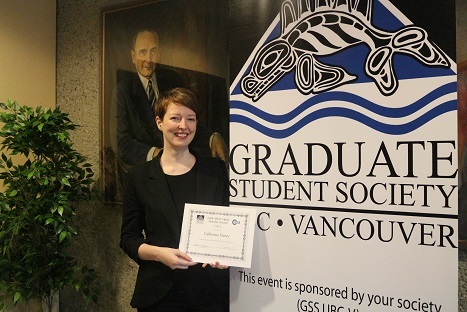 Along with other UBC Nursing colleagues, staff and faculty, Haney helped organize a successful graduate student research symposium held at the Irving K. Barber Learning Centre on May 2, 2014. It showcased innovative nursing research plus ideas and drew presenters from Canada, Washington State and as far away as Brazil. Congratulations to Saule Chikeyeva and Catherine Haney on winning the Award – valuing $500 each!